The Coen brothers have been careful to insist that their True Grit is more an adaptation of Charles Portis’ 1968 novel than it is of Henry Hathaway’s 1969 film. They have returned to the literary source in a number of key areas - as in the novel, Mattie Ross is a young teenager in the main part of the story, but narrates it from later in her life. The Coens’ movie, however, does not ignore its screen predecessor entirely - the two films share many similarities in the staging and shooting of scenes (for example, the ambush at the cabin midway through the film). Some of the earlier film’s changes to the novel are also retained - notably, the presentation of Rooster Cogburn as an older man (he is about 40 in the novel, whilst both John Wayne and Jeff Bridges played the role in their early sixties). Whatever the details of these continuities and departures, though, there remains the basic fact that an earlier version of the film exists and was, in its time, successful and widely seen. 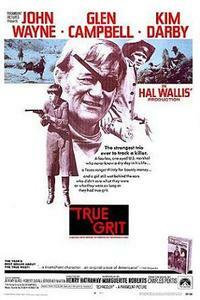 Up until the release of the Coen version, the most powerful association evoked by the title True Grit was the image of John Wayne with an eyepatch. With its well-known precursor, the new True Grit cannot avoid being understood as a remake, and I would like to consider it in these terms here. The relationship between different versions of the same movie is a reciprocal one. The earlier film establishes a series of standards and points of reference, in relation to which subsequent versions can be understood. In turn, a remake will reflect back on its predecessors. Through its points of similarity and difference, it will draw attention to aspects of the earlier movie that we might not have considered had we seen it in isolation. These different relations can be seen in the two versions of True Grit. John Wayne’s Oscar-winning performance in the 1969 movie established the role of Rooster Cogburn as a showcase for the acting talents of an older male star. In playing the same role, Jeff Bridges has to live up to the perceived standard set by Wayne, but he also has to offer his audience something new. This, I believe, accounts for Bridges’ stylised and eccentric performance in the movie. He is trying to match the Duke in terms of magnitude and impact whilst at the same time asserting that he is not John Wayne. Conversely, we might consider how the new film’s take on the relationship between Mattie and Cogburn affects how we perceive its portrayal in the older film. The Coen True Grit relies on its overarching structure to express the mutual respect and affection shared by its two main characters. The older Mattie looks back at Cogburn with fondness, and suggests that the bond between them has endured beyond the story that we see. For most of the movie, however, this bond is only hinted at. As I mentioned in my shorter review, Cogburn is too exaggerated and inscrutable a figure to do anything as straightforward as connecting with those around him. The difference between the two movies in this respect can be gauged from the staging of the scenes in which Cogburn shares details from his past. In the Hathaway version, he tells Mattie about himself face to face, at the campfire and in other similarly intimate settings. In the Coen version, Cogburn holds forth on horseback with Mattie riding behind him - he seems to be talking as much to himself as to her. In the 1969 movie we get a much more tangible impression of the relationship that develops between the two main characters. The relative absence of such an impression in the new film makes this all the more emphatic retrospectively. In the light of the more recent True Grit, the earlier Rooster Cogburn seems like a relatively soft and cosy figure, comparatively loveable and avuncular. This may sound like an extraordinary thing to say about John Wayne, but the passage of time can have some curious effects. Indeed, the shifts and changes in perception that occur over time are something that the Coen brothers’ True Grit seems to be interested in. The somewhat outré and opaque characterisation of Cogburn could be interpreted as an effect of Mattie’s memory. We might choose to understand the main part of the film as her subjective recollection of the hunt for her father’s murderer. In that case, perhaps the film’s presentation of Cogburn is as much an expression of the feelings she remembers - the combination of admiration and revulsion that she felt towards the marshal when she was 14 - as it is of the events themselves. In this context, the casting of Bridges is a particularly evocative choice. As a long-established, second-generation star, he carries with him a wide array of movie memories. Some of these relate to the history of the Western genre - his father, Lloyd Bridges, was in High Noon and was a recurring face in many other film and television Westerns. Through these and other associations, the presence of Jeff Bridges is able to create a sense of connection to the lost worlds of the past. One such world is that of the time at which the earlier True Grit was released: the late 1960s. Part of Bridges’ public persona, gloriously exploited in his previous collaboration with the Coens, The Big Lebowski (1998), is the impression he gives of being something of an ageing hippie. Like his performance as Rooster Cogburn, Bridges’ roots in the 60s counterculture (and the New Hollywood cinema that emerged in part out of it) serve to both connect the new True Grit to its predecessor and to differentiate between the two versions. If Bridges makes us think of 1969, it is a very different 1969 to that inhabited by John Wayne. At the time he played Rooster Cogburn, Wayne was widely seen as embodying the reactionary values of an older generation. My father, who is a similar age to Bridges, told me that you would have to have broken his legs before he sat down to watch True Grit in 1969, such was the Duke’s reputation among young people in that period. The Hathaway version of True Grit is partly about addressing this issue. It is a generation gap movie - Mattie Ross, as played by Kim Darby, is a young adult (with a 60s gamine look), rather than a precocious child. The film attempts to recast John Wayne’s relationship with the younger generation in more benign terms, bringing Cogburn and Mattie together in an unlikely but touching friendship. Bridges, we might recall, started his career at the other end of such inter-generational juxtapositions, playing alongside veteran character actors in The Last Picture Show (1971) and teaming up with a Korean War vet played by Clint Eastwood in Thunderbolt and Lightfoot (1974). Part of what Bridges brings to the role of Rooster Cogburn is a sense of how long it has been since such comparisons could be made. Regardless of whether or not we interpret him as distorted or exaggerated by Mattie’s memory, the film frames him as a figure of the irretrievable past. Which brings us back, once again, to the Western. If the 60s can seem like a lost world to today’s popular culture, the Western genre is doubly so. It has always depicted an imaginary world of the past, but now it is also associated with previous generations of filmmakers and audiences. As I mentioned in the review, filmmakers who choose to make Westerns now cannot rely on either the knowledge or sympathy of their audience. Quite apart from the problems that this poses with making the genre understandable to a contemporary audience, there is also the belief in some quarters that the Western is a discredited form, rooted in dubious and outdated ideologies. Whether or not we agree with this viewpoint, it is a clear indication of the perceived distance that now exists between the Western and contemporary culture. As I have already suggested, the Coen brothers find intelligent ways to address this perception and work within it. They take the unfamiliarity of the Western and turn it into a child’s-eye view on a strange, dark and remote world. However, they are still constrained by the contemporary conditions in which they are working. A good example of the effects of this can be seen in the showdown between Cogburn and Lucky Ned Pepper’s outlaw gang. In both versions of the movie, Cogburn bellows a challenge at his opponents, takes the reins of his horse between his teeth and rides into the fray with a gun in each hand. In the 1969 film, this can be a climactic, triumphant moment of heroic action. In the Coen version, it is still an act of great daring and bravery, but the editing, the music and especially the presentation of Cogburn make its impact more muted. With Bridges’ thick drawl and wild-eyed demeanour, it seems as deranged and perverse as it does heroic. There seems to be considerable uncertainty and ambivalence in contemporary Westerns about the kinds of actions and values that it is possible to affirm. Perhaps the most difficult question you could ask me about the two versions of True Grit is which one I prefer. They are both, in their own ways, very good movies, with their own particular charms. It is perhaps because they are the product of such different circumstances and conditions that no single standard can be set to judge them by. The Coen brothers are considerably more accomplished as filmmakers than Henry Hathaway was, but they also faced a much more difficult task in 2011 than he faced in 1969. This Alternate Take was published on March 11, 2011.